Ever since the onset of the financial crisis, the global economy has been struggling to revive itself and achieve a healthy growth rate. The global growth rate for last year and this year are projected at 3.40% and 3.80%. But compared to this, India’s GDP continues to grow at a fast pace, outstripping major world economies. According to IMF, India is projected to grow at 7.80% for this fiscal year. Source: Department of Commerce, Govt. of India. Without any dispute, SMEs are one of the key drivers behind this growth story. This sector, comprising of manufacturing, infrastructure, service industry, food processing, packaging, chemicals, and IT, has emerged as the most vibrant and dynamic engine of growth of Indian economy over the past few decades. Number of SMEs in India: The number is estimated to be at 42.50 million, registered & unregistered together. A staggering 95% of the total industrial units in the country. SME & Employment opportunity: Employs about 106 million, 40% of India’s workforce. Next only to the agricultural sector. Products: produces more than 6000 products. GDP Contribution: Currently around 6.11% of the manufacturing GDP and 24.63% of Service sector GDP. SME Output: 45% of the total Indian manufacturing output. SME Exports: 40% of the total exports. Bank Lending: Accounts for 16% of bank lending. Fixed Assets: Current fixed assets at INR 1,471,912.94 crore. 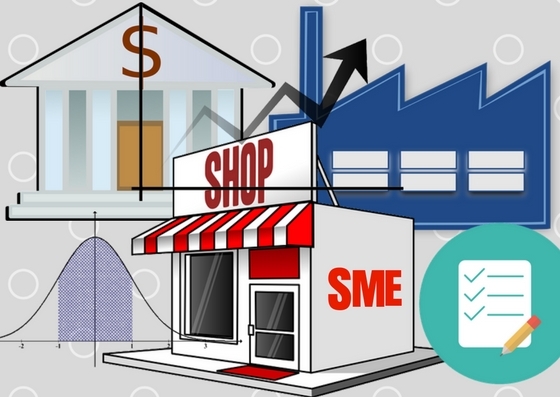 SME Growth Rate: Has maintained an average growth rate of over 10%. Credit Guarantee Fund Trust for Micro & Small Enterprises (CGTMSE). Objective: To make available collateral free credit facility to new and existing Micro & small businesses subject to a limit of Rs.100 lakh per unit. Performance during 2015-16 (up to 31/12/2015): 350056 Application approved with guarantee coverage of Rs.14,673 crore. Performance since inception: 2160975 Application approved with coverage of Rs.103,864 crore. Export Promotion of Capital Goods (EPCG). Objective: To allow import of capital goods on zero duty subject to meeting export obligations. Performance during 2015-16: Number of authorisation 22544 with FOB value of Rs.78,860 crore and duty savings of Rs.12619 crore. Performance during 2016-17 (up to October 2016): Number of authorisation 13,585 with FOB value of Rs.50,359 crore and duty savings of Rs.8,668 crore. Credit Linked Capital Subsidy Scheme (CLCSS). Objective: To facilitate technology up-gradation. To enable beneficiary enterprises to avail institutional credit towards the purchase of machinery and technologies. Performance during 2015-16 (up to 31/12/2015): 3,142 benefited units with an expenditure of Rs.203.76 crore. Performance since inception: 22,380 benefited units with an expenditure of Rs. 1349.63 crore. Lean Manufacturing (National Manufacturing Competitiveness Programme). Objective: To make accessible the use of various Lean Manufacturing techniques to SMEs and thus improve their manufacturing competitiveness. Performance during 2015-16 (up to 31/12/2015): Benefits to 670 units with an expenditure of Rs.11.26 crore. Performance since inception: Benefits to 3041 units with an expenditure of Rs.45.26 crore. Objective: To enhance competitiveness through increased awareness of IPR. Performance during 2015-16 (up to 31/12/2015): Awareness programs held-26, Workshops-05, and IPR Facilitation Centre-03. Expenditure Rs.1.73 crore. Performance since inception: Awareness programs held-308, Workshops-95, and IPR Facilitation Centre-31. Expenditure Rs.13.69 crore. Marketing Development Assistance (MDA) Scheme. Objective: To help & encourage SMEs to tap & develop overseas market. Performance during 2015-16 (up to 31/12/2015): Units participated 233. Expenditure Rs.4.77crore. Performance since inception: Units participated 1476. Expenditure Rs.28.76 crore. Source: MSME at a glance. 71% of the SME respondents hold an optimistic view about their domestic economy, followed by Japan with 62% and Japan with 54%. IBEF. The year 2017 has all the makings of an interesting year with GST following close on the heels of demonetisation. Those who have survived the effects of demonetisation are more likely to see sunnier days ahead. Market Base: Set to grow as interstate sales complexities are a thing of the past. Since there is no longer any tax burden on interstate sales, big corporates and manufacturers can procure materials & components from small players from across any state borders. Increased Competitiveness: Low-cost imports are no longer a cause for worry since tax levied on imports goods and local manufacturers will be the same. Freight Cost: Expected to come down by 1 to 2%, thus bringing down the cost of raw material and finished products. Cost of Raw Materials: Expected to come down with the disappearance of 2% CST on interstate sales. Sales & Service: Treatment of sales & services will be the same under GST means no additional tax burden on SMEs with a business model of sales and service. Transparency and Ease of Doing Business: The new indirect tax regime replaces multiple tax rules. Physical interface of bureaucracy expected to be nonexistent or minimal since registration, tax payment, input tax credit & tax liability adjustment, tax returns, and refunds will all happen online electronically. The same American Express Global SME Pulse 2017 was found stating that 37% of Indian SMEs considered flexible lending and repayment and 49% high-interest rates as important factors affecting business. Addressing these pain points will definitely make the road ahead much smoother. With the Indian economy expected to touch $5 trillion by 2025, and with groundbreaking economic reforms kicking in, SMEs are expected and bound to play a much more important role. B2B e-commerce, food processing, pharma, and homeland security and defence are the areas to watch out for.